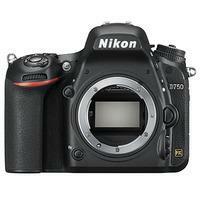 The Nikon D750 Digital SLR is designed for the serious photographer, offering 24.3 megapixels in a full-frame (FX) format, and touching on many of the important features found in the more advanced models, such as a 51-point AF system, powerful EXPEED 4 processor and Full HD video recording at 50/60p. Its large sensor and image processor provide excellent cropping flexibility, with the ability to capture clean images and videos across a native sensitivity range of ISO 100-12800 (exp. to 50-51,200). Fully weather-sealed and lightweight, the D750 is also equipped with a 3.2, 1229k-dot tilt-monitor, built-in Wi-Fi, two SD card slots and 6.5fps continuous shooting in both FX and DX formats.